This Me 261 A-1a Jabo is reportedly "gelbe 3" of 3./KG(J) 54 and was found at a small airfield across the river from the town of Moosburg (NE of Munich on the Isar River). Other extant photos reveal that the lighter portions of the Karoband were originally white. They were lightly but deliberately oversprayed with 81 Braunviolet to mute to contrast with the dark blue cheques and not compromise the aircraft's overall camouflage that was also oversprayed with denser Wellen of 81. There is also evidence of the KG 54 "Totenkopfwappen" ahead of the windscreen. It too was overpainted with 81 but in this instance with a brush. 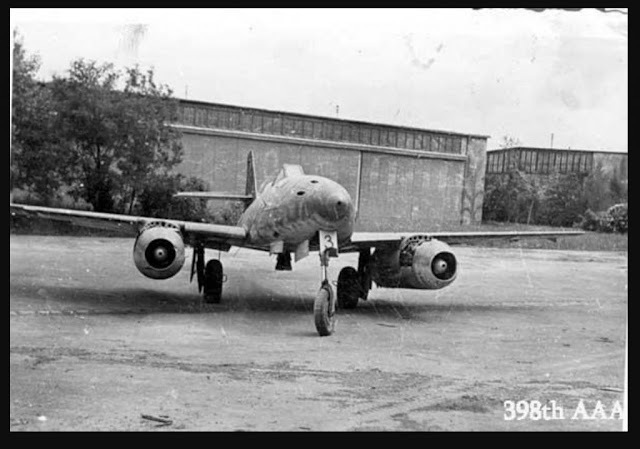 The overpainting of unit markings may well reflect the time when the remnants of Me 262 units operating in the Protectorate (KG(J) 6, KG(J) 54 and JG 7) were combined and folded into the ad hoc unit Gefechtsverband Hogeback in late April 1945. Brown and Wadman were the first researchers to indicate that the Karobands were linked to the Kampfgeschwader (Jagd) units. This was based on photos of an Me 262 A-1a “Yellow 3+I” dispalying a large style blue and white checker fuselage band ( originally interpreted as green/white) and most importantly, the famous KG 54 “Totenkopf” Geschwaderwappen. An article by Jan Horn on KG(J) 6 indicated via pilot testimony that red and black were the colours for KG(J) 6 and blue and white for KG(J) 54 respectively. 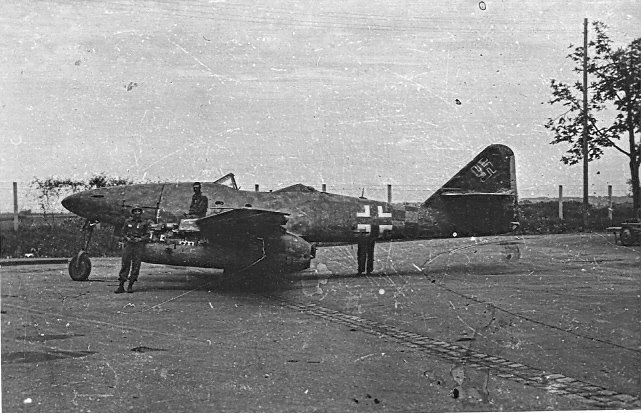 Recent photographic and crash report documents published by Jerry Crandall (Proulx, 2005) has linked an Fw 190 A-9 with KG(J) 27. 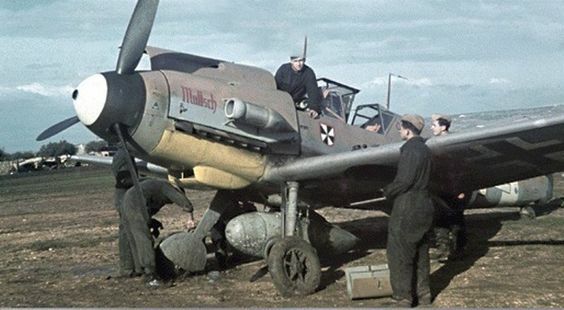 The colour photo of the Bf 109 G-10 at Kaufbeuren shows it wearing a green/white band.
" Those are great photos and assist with research on this machine that I believe it comes from the late 1105xx to 1106xx(ish) werknummer series.